Prairie falcon patient. Note the head shape. In a Minnesota city and its suburbs, it would not be surprising to see a falcon maneuvering around the urban landscape. Peregrine falcons, merlins, and American kestrels have all adapted to make these areas their homes. 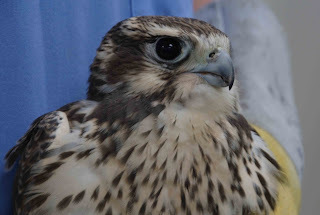 However, the falcon that was found in an intersection in Duluth, Minnesota last week was not any of these species; it was a young female prairie falcon, presumably pushed east by a group of storms that had recently rocked the state. Instead of her natural habitat of arid and semi-arid plains in western and southern states, she found herself in an intersection in a relatively large city in northeastern Minnesota. She was unable to fly due to a dislocated collarbone and was taken to Wildwoods Rehabilitation Center in Duluth for supportive care before being transported to TRC. Note the absence of barring on the central tail feathers. In addition to her collarbone injury, she was a little thin and dehydrated, but her spirit didn’t falter. Her enthusiasm for food became quite apparent and she has settled in nicely to her convalescent enclosure. Over the course of the next few weeks, she will receive physical therapy twice weekly to prevent her wing joints from stiffening as she heals, and will be given a varied diet of mammal and bird species. 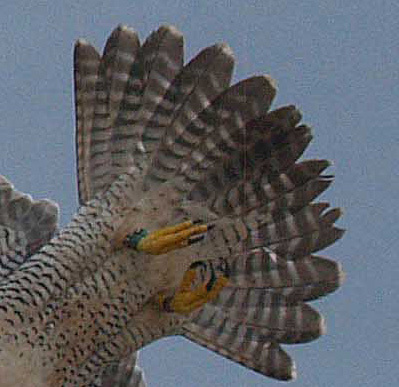 Unlike peregrine falcons, prairie falcons eat rodents as well as birds; in the wild, Richardson’s ground squirrels are commonly preyed upon by prairie falcons. 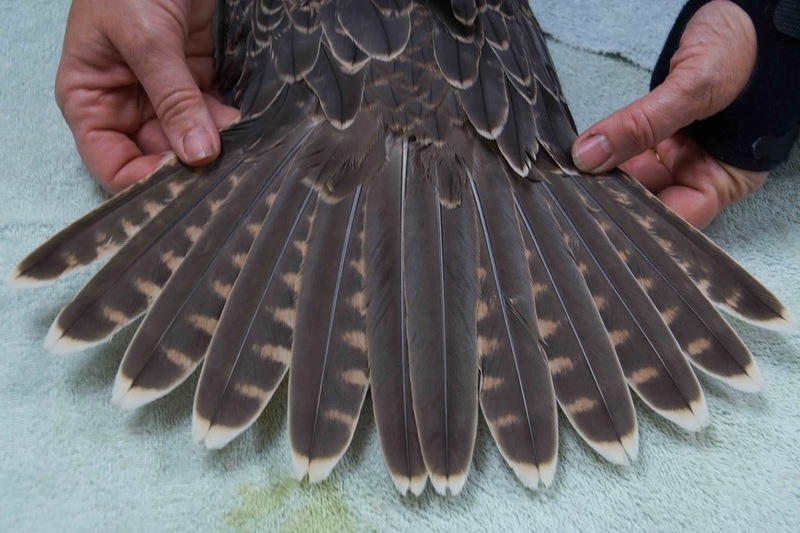 Tail feathers of a wild adult peregrine. Note the uniform barring across all 12. There are a few characteristics that distinguish peregrine and prairie falcons in the hand. 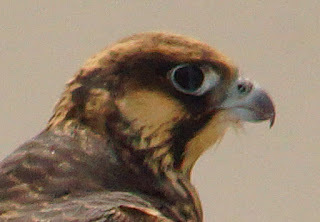 Prairie falcons have flat, blocky heads, as opposed to more rounded heads of peregrines, and their plumage, even as a hatch year bird, is paler brown than the rich dark brown color of most young peregrines in the Midwest. The feature that is the most definitive though, is the central two tail feathers. In peregrines all the tail feathers are marked with bars, but prairie falcons have two central tail feathers that are solid in color while all the others are barred. This is true for both a prairie falcon’s juvenile and adult plumage. Both prairie and peregrine falcons have size difference between the sexes. Females are a third larger than males for both species. This prairie falcon patient is unquestionably a female due to her size and weight. This bird came to our care because humans wanted to help raptors. We are grateful for the help and support for all of our clinic patients, which we could not assist without you.